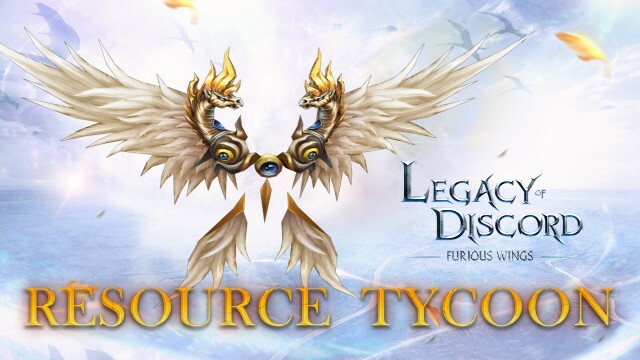 Legacy of Discord Event: Pegasus and Resource Tycoon! From Jan 5th to Jan 8th, the new Resource Tycoon will be online. By competing to collect resources, players have a chance to win the brand new Wrathwing, Pegasus! Pegasus is a name that has passed down from the greatest legends. This winged divine steed is known to be the mount of gods and the mightiest of heroes. Many gods and heroes alike have performed their legendary deeds while riding atop this majestic horse. With its unparalleled grace and speed, Pegasus can soar through the battlefield with invincibility. However, to earn the favor of Pegasus, a champion has to be truly blessed by the gods and destined for greatness. To borrow the power of Pegasus, the Pegasus Wrathwings were crafted using a single feather from the divine steed. That alone is enough to grant unimaginable power and speed to its wearer. Many Guardians seek to obtain the Pegasus Wrathwings in order to scribe their own names among the legends of Aurora. Note: Resource Tycoon will only be available on older servers from Jan 5th to Jan 8th. New servers (those that opened within 15 days) will have to wait a bit before seeing the event.